Use our quick comparison tool to find the best O2 SIM only deals available right now. With widespread 4G coverage and extra perks via their Priority offering, O2 are a popular choice with customers who want reliable and fast data speeds up and down the UK. Compare and save today. O2 are one of the biggest names on the UK mobile market, as well as being one of the oldest networks in the country. Originally using the name Cellnet, O2 has been in existence under one name or another since 1985. They’re currently the second biggest operator in the UK after EE. 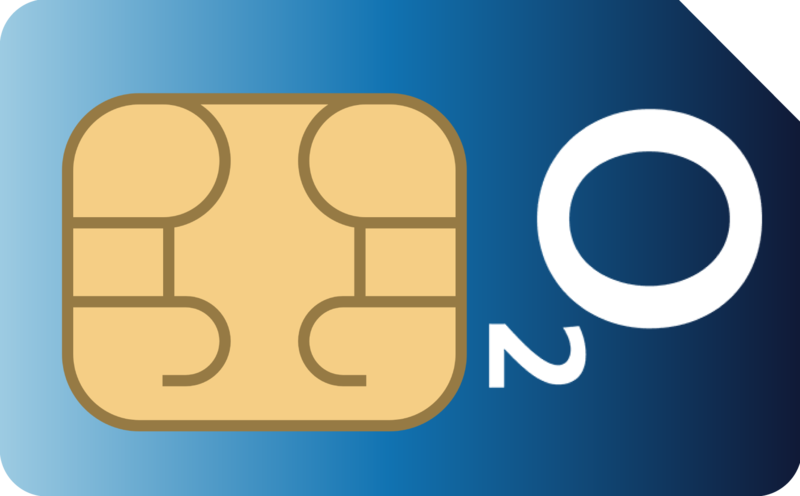 As a huge network, O2 offers lots of options for both SIM Only and PAYG customers. Because O2 is such a large operator one of the key features of service from O2 is simply the huge range of options available to fit every pocket. However, there are also some additional benefits to going through O2. O2 customers have access to the Priority app, which gives deals on all kinds of things. From offers for cinema tickets on new releases to cheap train tickets, discounts on sporting events, prize draws, deals on fashion and cosmetics, O2 customers are given plenty of bargains. O2 also offers special deals for families. A family account can connect up to seven different devices on the same bill. Plus, they have special accounts that allow you to control what kind of material children can access from their phones. In addition, O2 does have a network of over 15,000 WiFi hotspots across the UK. As an O2 customer, you will have access to these, meaning you may be able to cut down on your monthly data bills if you’re a frequent internet user. More Minutes: 50 calling minutes to UK numbers for £1 a day, expires at midnight. Data Bolt Ons: 100 MB for £3.50 a month, 500 MB for £6.50 a month, 1 GB for £10.50 a month, 2 GB for £13.50 a month, 4 GB for £16.99 a month, 8 GB for £22.99 a month, 12 GB for £30.50 a month, all of which are valid for 31 days and automatically renew. There is also a one-off 1 GB of data for £10 that is valid for 31 days and does not automatically renew. If you exceed your monthly contract limits for texts, calls, or data and opt not to add a bolt on to cover any extra use then you’ll be charged O2’s regular fees for use on top of the price of your contract. These fees are currently: 45p per calling minute and 15p per text message. Should you use up your data limit your mobile data will be cut off until the beginning of the next month or until you add a data bolt-on. O2 offer two different kinds of Pay As You Go service. Their classic PAYG SIMs offer a simple credit system. You top up your credit and then pay 3p per calling minute, 2p per text message (which goes up to 45p for MMS or picture messages), and 1p per MB of mobile data. If you opt to buy a Big Bundle for your PAYG service then O2 does roll over data as long as your bundle is set to automatically renew after a month. If you do not automatically renew, your data does NOT roll over. Rolled over data is only good for a further 31 days, after that, it will disappear. SIM Only contracts also have data roll over, and this is good until you reach 12 GB. Any further data that goes over the 12 GB limit will not roll over. O2 has excellent coverage across the UK. For 2G signals, O2 gets 99% coverage, for 3G they get 98% coverage, and for faster mobile data speeds they also get 97% 4G coverage. You will need to check the coverage map on the O2 website to check that you do get coverage in your local area, but with O2 most people will find they get good reception. If you tether, or use your phone’s mobile data as a hotspot to connect another device such as a computer to the internet, then O2 is a great choice for you. O2 allows tethering on all their SIM cards, including both SIM Only and PAYG.